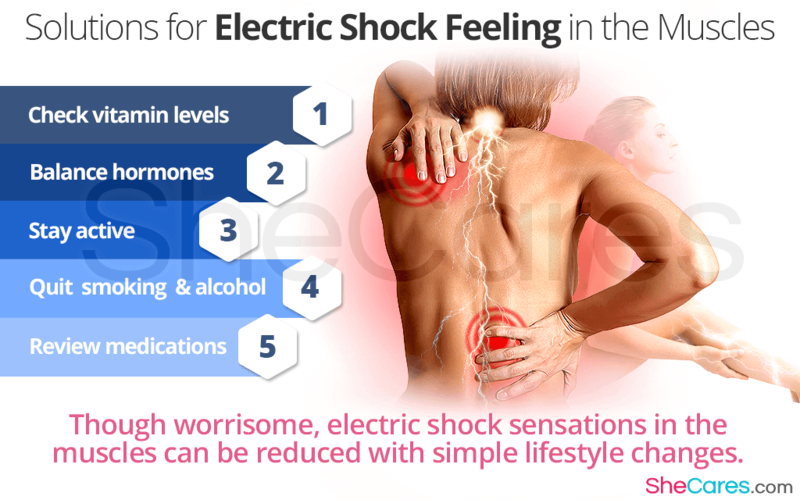 Electric shock feeling is associated with a wide range of medical conditions, but most women report experience it throughout their life either superficially on the skin or in the deeper tissues. Some women, however, report electric-like shocks or burning cramps in the muscles. Keep on reading to discover the possible causes of an electric shock feeling in the muscles and numerous solutions to handle them. Normalizing your vitamin B12 can successfully reduce the occurrence of electric shock feeling in the muscles and the rest of the body. Talk to your doctor about the best vitamin sources in foods, like dairy or fish, or supplements. If you notice that electric shock feeling in your muscles occur during or shortly after exercising, it might indicate disc or nerve compression. Try to change your exercise regimen for a few days and see if you continue experiencing the shocks. Sedentary lifestyle can lead to obesity and numerous musculoskeletal problems, including muscle electric shocks. Sign up for yoga classes out in the fresh air, take your dog to a park, or ride a bike to work or school. Both cigarettes and alcohol have been shown to damage the peripheral nerves and cause disc degeneration. There are ways to quit and improve your life. Ask your doctor for help or take advantage of free addiction helplines. Some women experience bothersome side effects, like muscle electric shocks with certain drugs, but modern medicine often offers many alternatives, so ask your doctor if changing medication is an option for you. Even if you have been diagnosed with a medical condition that cannot be cured, there are numerous ways to manage it and lessen its impact on your life, such as controlling your blood sugar levels more effectively. Most women report that the electric shock sensations in the muscles impair their normal activities and cause a great deal of worry. Severe cases of muscle electric shocks require a pharmacological treatment, such as the hormone replacement therapy (HRT), but it should be prescribed with caution as it comes with serious side effects. Simple lifestyle practices can reduce the occurrence of shocks without causing any unwanted reactions and allowing you to enjoy life in its fullest. Read more about signs of electric shock sensation.